Miami, FL – (April 9, 2019) – Zensah®, the leader in high-performance compression apparel, announces a collaboration with Ultramarathon Man, Dean Karnazes. 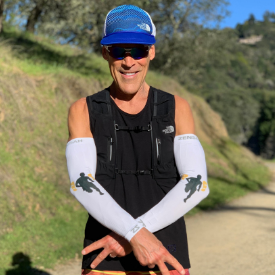 On April 9, 2019 the Zensah & Dean Karnazes compression sun sleeves launches at www.zensah.com and specialty running retailers. As the world heats up, keep your cool with our newest UV protective sun sleeves. Created in collaboration with Badwater Ultramarathon winner and 4 Deserts Champion, Dean Karnazes, these specially designed sun sleeves are engineered to protect runners from the elements by blocking up to 98% of UV radiation. Moisture-wicking and cooling, they shield athletes from the sun and help prevent overheating, along with an inspirational quote to keep you going when the going gets tough. “Dean represents living life without limits, a mantra of Zensah®” said Ze’ev Feig CEO of Zensah. “Dean has inspired millions of people around the world and it is an honor for us to team up with him and bring awareness to the important issue of climate change and the need for sun protection.” Mr. Feig continued. The Zensah compression arm sleeves are ideal for trail running, road running, cycling and any outdoor activity. These compression sleeves have a second-skin feel which makes them the most comfortable compression arm sleeves on the market. They are made with a seamless design and ergonomic contour for ultimate comfort.